Mullein tea is a wonderful herbal infusion that has been much admired for its many uses throughout time. The most important benefit comes from its decongesting and relaxing powers. Despite being often mistaken for a weed this simple plant is grown for its many medicinal purposes. With a lovely sweet honey-like aroma, this is a tea that should ready for use at the first signs of a cold or flu coming on or when you need a detoxifying agent. Come and learn more about this healing tea! This plant reaches up to 2 meters or more in height with a long straight stem. It has small bright yellow flowers that are sweet and smell like honey. Mullein blooms in the second year of life in the months of July and August and its showy flowers are perfect to attract insects to help with pollination. Its big oval leaves are long, nearly 60cm/2ft, with a velvety and wooly surface giving them a grayish green color and a soft thick feeling. Mullein has many other common names, often referring to its hairiness, such as feltwort, Poor Man's blanket, Our Lady's blanket, flannel leaf, donkey's ears. Other common names reference the shape of the plant: Aaron's rod, Shepherd's staff or club, Jupiter's staff and so on. Finally, there are common names that refer to the plant's historic uses: cowboy toilet paper, candlewick plant, lungwort and torch plant. For a long time, Mullein has been used in traditional medicine. There are examples of this in many Native American tribes who used to make mullein tea to help treat a number of health problems. The plant had been brought over from Europe in the early 18th century, and by the following century it was well established in America where it was cultivated for medicinal and pesticide purposes. Additionally, this plant was often used to ward off curses and evil spirits. The whole plant would be used in religious ceremonies, for example, stalks dipped in fat would be used as torches in processions, whereas the dried leaves would be made into candle wicks. Many ancient uses for mullein are still much valued today. Drinking mullein herbal tea for its medicinal purposes is greatly appreciated by many. The flowers are used to produce yellow and green dyes that may be used to rinse, nourish, brighten and highlight blond hair. As flowers are boiled in water they begin to give off a beautiful yellow dye. The traditional practice of making candle wicks from the leaves and torches from wax-dipped stems is kept up today. Such candles may find their way into ceremonies as well as to keep insects away. Mullein tea contains a number of elements that make a healthy herbal remedy. This tea is a great source of vitamins such as B2, B5, B12 and D. It also contains mucilage, flavonoids, iridoids, sterols and sugars. Other chemicals include: choline, iron, magnesium, potassium, sulfur, and saponins. A mix of all these components provides you with many benefits in each cup of tea you drink. Take a cup of mullein herbal tea when you need help fighting a cold. It is considered a chest decongestant, allowing you to breathe better while at the same time strengthening your lungs. Mullein tea may help stop nasal drip and tell your body to relax bronchial passages and release thick mucus that is causing you to feel so congested. This expectorant tea may bring relief from chronic coughs and hoarseness. It acts by soothing and sedating the respiratory tract and treating an inflamed trachea. Add honey to your tea when drinking it or simply gargle with this warm infusion to calm your throat. Drinking mullein tea may help treat bronchial infections and symptoms of pneumonia. Of course, you should seek the advice of your doctor with these serious ailments, to guide you and monitor your progress. This herbal tea may also target other respiratory problems, such as allergies, hay fever and asthma. Its calming action may help relax your lungs letting you breathe as well as getting rid of the irritating elements causing you problems. Mullein makes a great herbal tea to take when you are in digestive distress. It may treat a recurring stomach ache, but also strengthen your digestive system protecting you against future problems. So take a cup of this herbal tea when you are suffering from abdominal cramps, constipation or diarrhea. Be careful, this tea acts both as a diuretic and a mild laxative, so it may reduce fluid retention. Drink lots of water as you may become dehydrated when experiencing these symptoms. This tea may also help expel parasites from your digestive tract, such as intestinal worms. As mullein contains mucilage, this will help form a protective barrier in your intestines against future attacks and reducing the possibility of inflammation. Mullein tea is considered a calming tea because of its narcotic and sedative properties. Its anesthetic action is said to help those in severe pain or who suffer from muscle spasms. Its sedative action may also be used to help relieve other types of pains such as menstrual and all sorts of cramps. And it is a refreshing tea to take when you are suffering from headaches or migraines. It may be ideal to relieve that tension that could be causing the pain. A cup of this tea may naturally bring relief to those who have trouble sleeping and need a bit of help relaxing and fight insomnia. It may calm nervous tension, fighting apathy as well as anxiety and stress. Take a cup of this tea before going to bed. A daily cup of mullein tea may help your body to get rid of toxins, bacteria and other harmful elements that could be making you sick. It promotes circulation and may help to cleanse the blood. Mullein herbal tea may help decongest the lymphatic system, thus providing a boost to your immune system, helping to speed up recovery from illness as well as prevent disease. It is said to help reduce inflammation that could be causing you painful arthritis as well as reducing the risk of tumor growth. This herbal tea is said to help treat all sorts of infections, for example, bladder and urinary tract infections, including bloody urine. It is said to ease a nervous bladder helping reduce instances of incontinence. At the same time, this tea is also considered a good infusion for reducing glandular swelling, by removing the inflammation and restoring health and even improving thyroid function. A mullein infusion may be used topically to soothe and calm irritated skin. Its cleansing and softening action is said to help relieve acne, eczema, bruises, rashes, boils and other skin issues. Make a poultice and apply to scraped skin to help treat tissue, reduce swelling and sprains. Its antibacterial action may help to heal wounds and dermatitis. A cooled mullein infusion may be applied to cold sores, treating viral and bacterial infections. A poultice may also relieve the pain of an ear infection, but you should not use it on a perforated or ruptured ear drum. Do you have blond hair? Then you may use mullein tea as a rinse to help brighten your hair. Would you like to take a sip of this decongesting tea? or purchase your mullein tea from amazon.co.uk! Even the best herbal remedies require a few precautions, so let's take a quick look at some of the possible side effects of mullein herbal tea. Allergic symptoms caused by mullein tea include tightness of the throat and chest resulting in difficulty breathing and slight chest pain. If this happens to you, stop taking mullein tea immediately and if the symptoms don't subside go to a hospital. If you are using this tea topically be aware that the leaves have tiny hairs that may cause your skin to become irritated, inflamed or itchy. This is rare, but it may happen, so always test this tea on a small area of skin first. You should always stick to the recommended dosage, because drinking too much of this herbal tea could cause stomach upset. While this herbal tea is considered safe for children, people with liver problems and pregnant or breastfeeding women, it should be taken only under medical supervision and prolonged used is not advisable. Do not make mullein tea using its seeds. Seeds have been found to contain narcotic and toxic elements. If ingested, mullein seeds could cause vomiting, diarrhea, abdominal cramps and even convulsions. It is best not to use mullein seed infusions topically either. Now it is time to learn how to make mullein tea. You are going to love just how easy it is. You can make a cup of this tea using mainly dried leaves or flowers. Mullein flowers are considered more powerful than the leaves, but both may be used for medicinal purposes. Start by boiling water in a kettle. As the water boils, prepare the teapot and your cup. You may even use hot water to preheat your tea set, this way the water will not instantly cool down when it hits the cold surface of the ceramic. Just make sure to toss it out before it cools down too much. Place 1 to 2 teaspoons of dried leaves and flowers per cup of water (approx. 250ml) inside the empty teapot. Pour the boiling water into the teapot and let the herbs steep for 10 to 15 minutes. Strain and serve. You may sweeten the brew with honey if you wish as this tea may have a bitter taste. Lemon or lime juice may also be added for a better tasting tea. Drink 3 cups per day at the most. This should be enough for you to get the benefits of mullein tea. If you make this tea using mullein root you will get an infusion that will also help with bladder incontinence. Elderberry and mullein make a wonderful blend to treat respiratory problems such as colds, congestion and allergies. Its anti-inflammatory action is great. Echinacea and cleavers blend well with mullein to create a tea that soothes glandular problems. Catnip may be added to mullein to create a calming and soothing tea. It is also said that this combination may help with pancreatic inflammation. Buy Your Mullein Tea Today! Click on the image or on the link below to purchase from Starwest Botanicals your Organic Mullein. 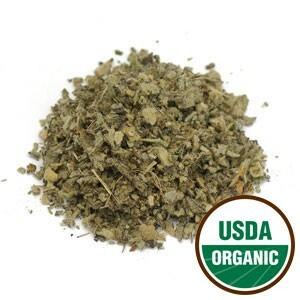 Brew your cup of decongesting tea from organic mullein powder or leaf. A hot cup of tea will help you feel better and begin the healing process helping you back to health quickly. Buy your Mullein tea now! Next time you feel you are coming down with a bad cold, brew a warm cup of mullein tea and head straight to bed. Get comfy and rest. Soon you will be feeling better and out and about again! May this tea help you get well soon!